Welcome to my new online shop here at The Table where you will find works on paper by artists who exhibit regularly with me in the gallery. I wanted an online presence for gallery artists between their exhibitions but I also wanted to show drawings for you my buyers; these pages offer an eclectic mix but also a more affordable price point as they are all unframed making them much easier to send out to you. Click on any artist and see their curated gallery page … enjoy! 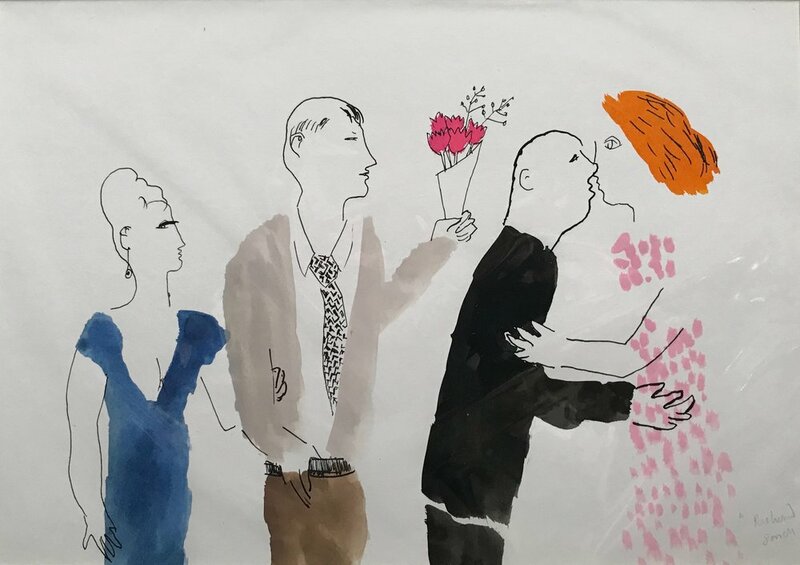 Julian’s recent work focuses on the contemporary figure, exploring the meeting up of grouped people in bar and café society. Painted with characteristically long limbs and angular torsos Julian’s economic use of paint brings out the essential relationships of youthful figures. He also enjoys painting figures, coastal landscapes and still life in his favourite haunts in Corfu and all over the West Country. Julian works mainly in oil and gouache. He also makes smaller studies on his trips to London, Bath and the West Country with his conte pencils. On returning to the studio he will work these drawings up with gouache into smaller paintings. Some of these images Julian will turn into oil paintings in his studio. Julian has been painting almost every day for about thirty years now, and has developed a very concise style, characterised by his ‘drawing in paint’ approach. This leads to very clean and clear colour, painted with considerable impasto, but separated by scraped back patches. The scraping back allows each mark to ‘stand alone’ and the colour to sing out. Sophie describes her work as ‘loosely impressionistic’, encompassing landscape, still life and figurative subjects as well as urban and industrial landscapes. She works in a variety of media often combined with collage – adding contrast and texture. Drawing on her strong visual memory, she introduces remembered colour combinations. Recently she has returned to working with oils and is excited by the possibilities this presents for the future. Born in Hereford in 1946, Carolyn took up painting at the age of ten, at Saturday classes in the old College of Art in Hereford. She attended full-time at Hereford College of Art as a mature student, and then studied with Welsh artist Roger Cecil, who remained her mentor until his death in 2015. Carolyn works at home in her studio amidst the gathered relics of flotsam & jetsam of her walks and travels. 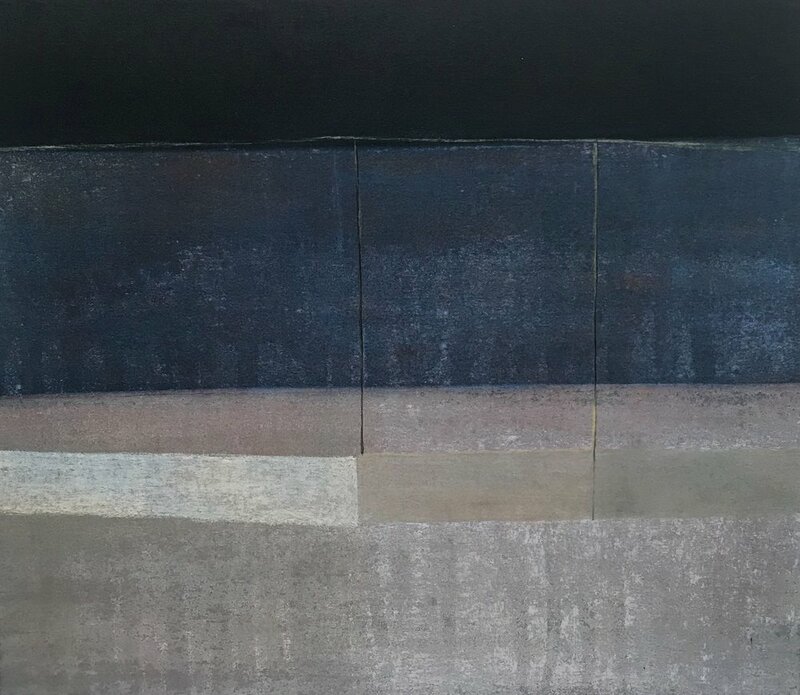 Her mainly abstract work is inspired by and concerned with landscape and the elements, geological faults, ley lines, chalk markings and ancient sites, always attempting to create connections between the organic, the archaeological and the spiritual. Paintings/drawings emerge through a process of layering paint and graphite, scratching and sanding until the traces of time and memory are transformed into a rich and resonant image. Helen won the prestigious Pollock Krasner award for painting in 2012 and has exhibited internationally. She studied painting at Wimbledon School of Art graduating in 1989 and she moved to Wales in 1996. She creates abstracts that are often monochromatic on both the small and large scale. She has a very emotional and intuitive response to her chosen materials, the sticky viscosity and watery oils vying for attention as she strives to capture Beauty. Lois studied Fine Art at The University of Newcastle Upon Tyne 1982 - 86 winning the South West Open Young Artists Award in 1986. She then went out to work for twenty years beginning with Textile Conservation at Hampton Court Palace and ending up on the set of a Harry Potter film. She gained an MA in Screen Design from the NFTS in 2002. Since moving to Wales she has settled in Knucklas with her partner the potter, Tony Hall, and their twins, where they have established Castle Hill Arts and run a small flock of sheep. "I love sketching and turn the small pen drawings that I make on walks into big landscape works. Small images are projected onto paper, ply and gesso and worked up into painted drawings in the studio. The landscape, the hill farms, the odd geometry of the shapes of fields and the weather all inform the paintings which I make in the studio". In 2010 Lois won the ING Drawing prize at the Mall Galleries. Charles trained at Camberwell School of Arts and Crafts (Dip. AD) and Brighton Polytechnic (Art Teachers' Certificate). After a period of teaching and working as an auxiliary nurse, he was awarded a major bursary by Southern Arts which enabled him to paint full time. Initially painting landscape, he gradually abandoned this in order to paint more intimate subjects in a domestic setting. Through still lifes and interiors he tries to evoke in paint both the objects and the atmosphere of his everyday surroundings. Working slowly with muted tones and simplified compositions, stillness and calm predominate. In 1986 he moved to Herefordshire where as well as exhibiting regularly he has curated a number of religiously themed exhibitions. He also exhibits in London with the Piers Feetham Gallery. In 2015 he was given a solo exhibition in Louisville, Kentucky as part of the Thomas Merton centenary celebrations. Born in Glasgow, Stewart graduated in 1977 from Glasgow School of Art in sculpture. He studied for an MA in European Fine Art in the Barcelona Studios of the Winchester School of Art graduating in 1994. He lives and works in Hay. Richard is a painter of invented figurative paintings - ‘people doing things’. His distinctive pictures are reinventions of reality, based on a lifetime of drawing and painting and looking at life. For some years he worked mainly as a landscape, portrait and still life painter, and as a painter of aerial views, mainly of grand houses. He was President of the Royal Watercolour Society from 2006-9, and is also a member of the New English Art Club, the Royal Society of British Artists and the Art Workers Guild. He has had many solo and group shows in Britain and the USA. His work is represented in the V&A Museum, Museum of London and the collection of the National Trust and in many private collections. Richard lives with his wife Sue in the far west of Cornwall. "My subject matter is wide-ranging, sometimes becoming abstract or semi abstract, always built on drawing and often memory. I just enjoy the conversation and the struggle with whatever medium I have chosen. I never have an end in mind, I just stop when the work feels right." Anthea trained at the Ruskin School of Drawing at Oxford University and for 25 years taught art at Harrow School. Peter's work is concerned primarily with the natural world, embracing its history and precarious future, as well as man's place in that world. Though a full time teacher of English and Classics at Harrow School (1971-2004 ) he has always drawn and painted and began contributing to mixed shows, notably at the New Grafton Gallery and The Bloomsbury Workshop in London, in the 1990s. Since 2003 he has shown mainly with Abbott and Holder Ltd, London. "I still find painting a very difficult activity. Its unpredictable. At the start of each day I am not sure that anything good will result and I have given up on achieving a style. Whatever develops, happens. There is no clear idea or vision of how a picture will look." Michael was born on 6th June 1938 in London and he attended Harrow School Of Art. He uses oil or watercolours for painting and pastels and charcoal to draw. He has a very traditional way of working. He often works on 6 or more paintings at a time and he draws regularly and works from paintings. Drawings can be around for years before he thinks of using them in a painting. In 1985 he was elected a member of the New English Art Club.